In the context of writing a tour guide on the island Krk, Tomaž and I visited this magical town of Vrbnik. Magical was not only the city but also apartment Ulikva in which we stayed during our exploration of the town. Apartments Ulikva are situated in a quiet part of Vrbnik, surrounded by olive trees. The house has a ground floor apartment, which is used by the owners, and offers two well-equipped apartments on the first floor. From the terraces of both suites you have a breathtaking panoramic view of the old town Vrbnik, sea and mountain Velebit. The apartments are new, very well equipped and air conditioned. For an extra charge they allow pets. The first apartment is designed for 4 + 1 persons (pull-out sofa, can also be suitable for two people). The second apartment is designed for 2 + 1 persons (pull-out sofa, can also be suitable for two people). When we entered the apartment we first saw a combined living room with kitchen, dining and living room with sofa bed and satellite TV, and of course beautiful covered terrace equipped with table and chairs. 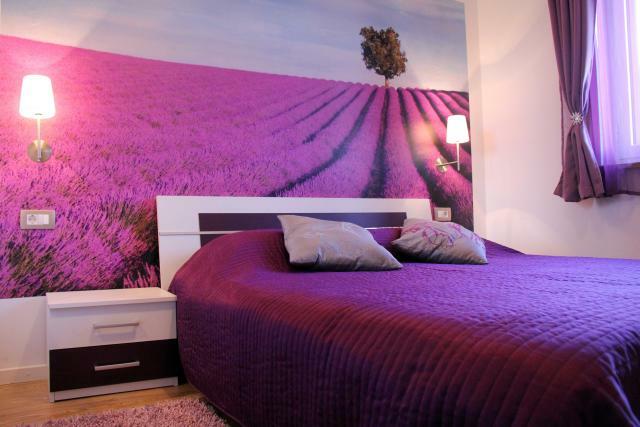 There is a little hallway which you walk on to reach the main bedroom with gentle violet colors walls and a lavender field painted on the canvas, which is placed above the bed. 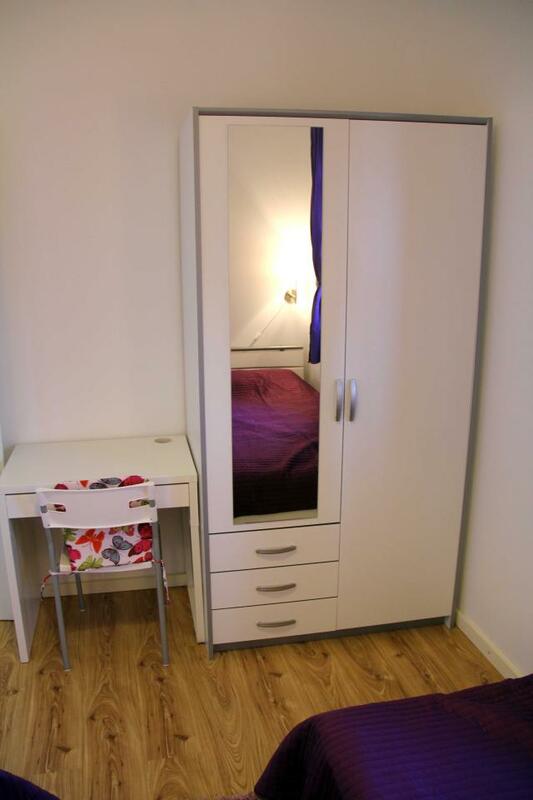 The main bedroom also has its own separate toilet. In addition to the main bedroom is another bedroom with twin beds, which can optionally be combined to make a double bed. If you look through the window you can see the olive trees, which are planted in the area. The apartment has a spacious bathroom with a modern shower and toilet, were we got a lot of fresh, soft and fragrant towels, new soap and hairdryer. The kitchen is well equipped with electric stove and oven, fridge, all necessary crockery, coffee machine, toaster, electric kettle, kitchen cloths, garbage bags, etc. They also have a very nice garden with local Mediterranean plants, behind the house there is a mini children’s playground with a sandbox and a slide. If desired, you can use the garden grill. The house has a spacious parking lot. If you want to walk to the nearest beach, it will only take you a few minutes, because the object is about 400 meters away from the nearest beach and about 550 meters from the shops and the town center. The owners, in addition to the Croatian also speak fluent Italian and English, they live in the house on the ground floor, so in case of any problem, you can always contact them. What I liked a lot was that there was enough electrical outlets in the house, which always come in handy. I was very pleased with the apartment, it really was top of the top. Color and position of the furniture were designed with real feeling. When you wake up in the morning and step onto the terrace, see the best view around, your day simply cannot start bad. We also received their homemade wine as a gift. 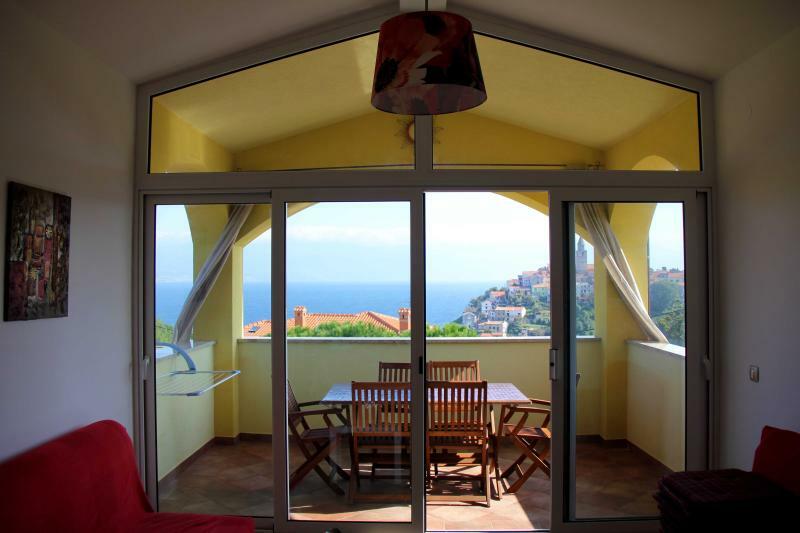 So, if you want a combination of history, blue sea and unspoiled nature along with a beautiful apartment I recommend you to visit Vrbnik and stay in apartments Ulikva, you will not regret.